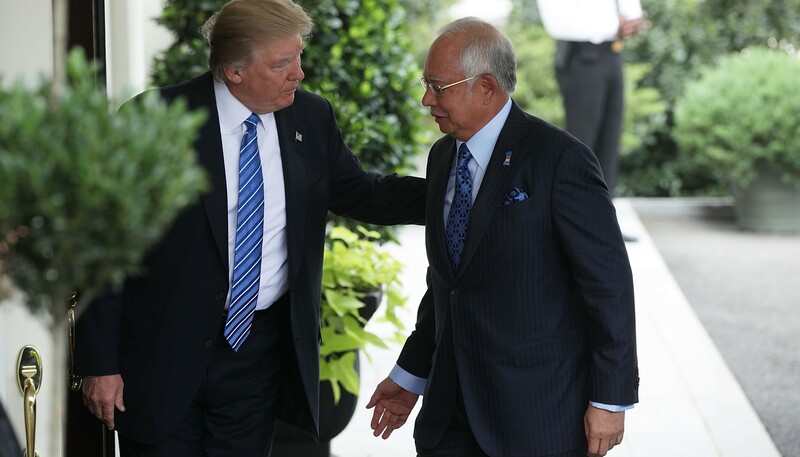 Malaysian Prime Minister Najib Razak's meeting with US President Donald Trump last week drew sharp criticism from within Malaysia and the US even before the leaders sat down to talk. It was Najib's first working visit to the White House and detractors were quick to view the invitation from President Trump as symptomatic of something rotten in both nations. The invitation was viewed variously as indicative of US indifference to allegations of corruption and authoritarianism levelled against Najib; of US abandonment of its commitment to democratic values and principles; or its de facto approval of a leader mired in the controversy of a Department of Justice investigation into the Malaysian sovereign wealth fund, 1MDB. These criticisms were not unexpected. Najib is not the first Malaysian politician to be accused of authoritarianism nor, frankly speaking, the first to be mired in scandal. However, given the optics of a transactional US presidency and the chatter of impending elections in Malaysia, the political stakes are more pronounced. What seems to have been forgotten amid the protests over personalities and politics is that the substance of the US-Malaysia relationship has been of significant value to both countries in many respects and for many decades. That relationship was institutionalised in a US-Malaysia Comprehensive Partnership in 2014 – it warranted reinvigoration with a new US administration elected last year. Last week's visit included a set of 'value propositions' that Najib tabled to Trump, outlined almost exclusively as a business offer of Malaysian public and private sector investment in the US. Critics decried this as a show of subservience that reinforced Trump's self-belief in his deal-making prowess and would simply serve to make America – and only America – great again. The approach was perhaps unconventional, but arguably astute in striking a chord with an unconventional President. Yet, investment deals aside, the real value propositions were in affirming the intangibles: the long-standing defence and growing security relationship; the strategic benefits of regional engagement and coordination; and the future returns on investment in enduring people-to-people ties. Najib joked to his audience at a luncheon address in Washington, jointly organised by the Center for Strategic and International Studies (CSIS) and the Institute of Strategic and International Studies (ISIS) Malaysia, that the defence cooperation between the two countries was probably the best-kept secret of the bilateral relationship. He had made the same observation a decade ago speaking at another think tank in Washington as Defence Minister. Good things last a long time. While US-Malaysia defence cooperation is too sensitive to publicly tout in Malaysia, it has served to tether the overall relationship, especially when political and diplomatic ties were less cordial. This defence cooperation has deepened in the quantity and quality of joint exercises, marking a growth in trust and capability between both forces in multiple domains. This will prove increasingly important as operations cross between the physical and virtual domains, compelling defence and security forces to share experiences and expertise in operating in cyberspace. Over the years, and particularly after 9/11, bilateral defence cooperation broadened into a security relationship focused on counter-terrorism, law enforcement, and intelligence. Last week's visit reinforced that dimension of relations in light of the threat posed by Daesh 'from Mosul to Marawi'. However, the message of moderation would have been more pointed and Najib's push on the behalf of the Rohingya more emphatic if it had been made clear that, in acknowledging the festering grievances that often lead to extremism, no one group of people should be targeted for their faith, nationality or skin colour. Evolving flashpoints in the Asia Pacific provided another opportunity for an understated value proposition. North Korea's repeated missile tests gave reason for Najib to reiterate his message of non-proliferation from seven years ago when he met with then-President Barack Obama on the sidelines of the Nuclear Security Summit in Washington. They also afforded Najib the opportunity to underscore the importance of international law and a rules-based framework to resolve tensions. The application of this point to the South China Sea dispute was not lost on Washington's Southeast Asia policy community, preoccupied as it is with the South China Sea. In this regard, the joint statement did not disappoint. Observers hailed Malaysia's apparently newfound assertiveness on the issue, but the truth of the matter is that this firmness always existed. It was just never brash. It was notable that the joint statement from the Najib-Trump meeting sought to enhance the bilateral comprehensive partnership and reaffirm the US-ASEAN strategic partnership, given that both were legacy items of the Obama era. There was even explicit mention of maintaining ASEAN centrality in the regional architecture. Thus, while Trump's administration has been variously described as unpredictable or unclear in its articulation or direction of policy towards Asia, it has been undramatic in practice thus far regarding its relations with Southeast Asia. Perhaps counterintuitively for a transactional US administration, there was recognition in the joint statement of the necessity of strong people-to-people ties – an intangible with no quantifiable rate of return – for the future of the bilateral relationship. There are two final points to note. First, despite the lack of clarity originally anticipated under a new US administration, it is the bilateral relationship's continuity that has seemed to prevail in many respects – testament, in and of itself, to the strength of these ties. Second, the bottom line is that state-to-state relations are seldom underwritten by political leaders alone. The US-Malaysia partnership is comprehensive for a reason and should be assessed for its substance rather than for its optics. There are shortcomings to the relationship, no doubt, but the existing ties are greater than the sum of their parts.